They had me at Dachande. Doesn't this Predator have an Alien head on the front of his armor, like Stalker? 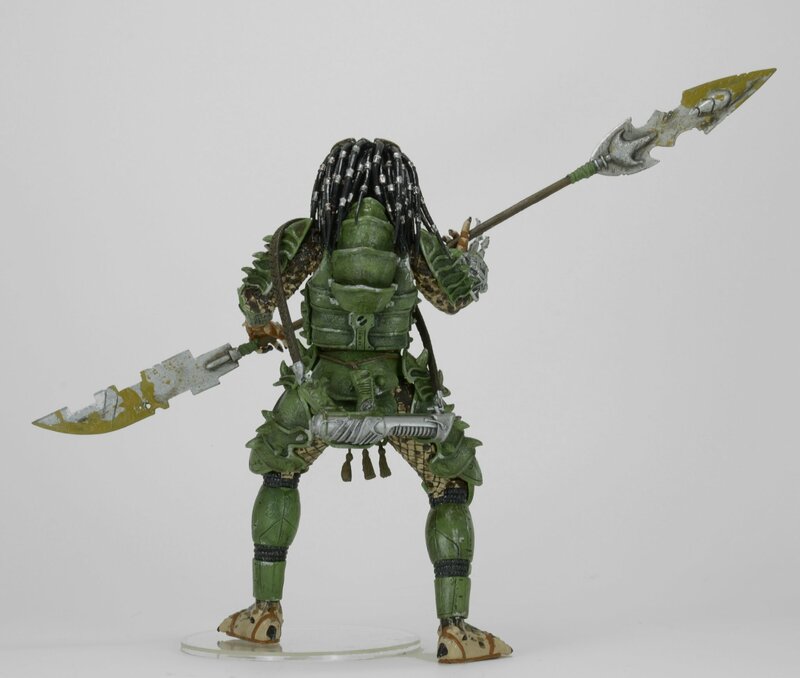 BTW, that big bladed spear that Dachande has reminds me of the naginata the Predator Hunter wielded in Capcom's Alien Vs. Predator arcade game. Man, I really wish NECA eventually does figures of all four characters from that game, although I heard that Capcom was a pain in the balls to deal with when NECA was making their DMC Dante figure...that might rule out any future deals between them. Gah! What a tease! I can't wait to see how they handled the chest armor and helmet, as those are his most defining features. SUPER excited for this one and I hope it opens the door for Machiko and the AvP arcade characters. Stalker's chest armor (even the old Kenner toy) is based on Broken Tusk's (Dachande's). I think one time Randy may have said that they can do the predators from that game since Capcom can't claim any rights over those characters but they can't make the human characters because Capcom does hold those (even though one of them is Dutch but I imagine the redesign for the game was different enough that Capcom claims it). It stands to reason though that if they could do the predators from that arcade game then they could also make the aliens. Not familiar with the AvP arcade characters but Machiko, Hell yes! NECA is going with Broken Tusk as the official name as opposed to Dachande. Makes sense, only the novelization actually provides him with the proper name. Machiko in the comic only ever calls him Broken Tusk. Well, the art really doesn't impress me and the Predator designs are too bland for my taste. Dark Horse AvP comics have much more interesting characters. NECA can do wonders but if these arcade ones ever materialize in figure form I'll be saving my money. It looks like he is taking a dump and is stuck with three dangling turds. wasn't this the Predator we were talking about a year or so back ? You are legally blind and possibly high on all the drugs. I'm inclined to agree with you. Capcom has consistently employed some of the best artists in the industry over the years. I love the AvP character designs. Whoa. Are you the artist of the attached pic? If not, why are you taking this criticism so personally? Allow me to elaborate. For one, the proportions are all wrong: just look at the pea-sized head on the Major... And two, the Predators lack any personality -as presented in the attached image-. Now I have never played this game so I'm coming in totally unbiased. Maybe their video rendering is way better than the art presented here. If so, then yay. If not, then I stand by my comment that this art here does not impress me. This said, NECA usually delivers incredible interpretations in figure form. I'm sure if they decide to move forward with making figures based on this AvP arcade game they will make very appealing products. Joking. I'm sure the characters were way better defined and properly proportioned in the game. I'll have to look it up. Color me curious. Damn I'd love a wave of these. I loved that game. Honestly, the AVP Preds are just Jungle and City Hunter. In which NECA just hit those two out the park with the Ultimate figures. Although the in-game sprite art depicts them in an almost identical fashion, the select screen art and other key art clearly shows the intent of the designers. For one, the proportions are all wrong: just look at the pea-sized head on the Major. It's the Anime art style, which is all about exaggerated proportions. Either you like it or you don't, I guess. Now I have never played this game so I'm coming in totally unbiased. Maybe their video rendering is way better than the art presented here. But seriously, that game is worth a playthrough if you're a fan of this series. So cool that it even exists. 1) I've never heard of that game until now but it looks awesome. 2) I'm getting this guy for the spear/naginata alone.